The Ignatian Family Teach-In for Justice (IFTJ) is the largest annual national gathering of people inspired by the spirituality of St. Ignatius of Loyola. More than 2,000 people will gather in Washington, D.C. to learn, pray, and advocate for social justice. Join the growing number of individuals who use the Teach-In as a time to connect to the Ignatian network and the call to work for justice. Note: IFTJ registration is sold out, but you can still register for the IFTJ Young Alumni Happy Hour. Young alumni (ages 21-35), as well as current and former Jesuit Volunteers, are invited to attend a Q&A with Joan Rosenhauer, with special guest emcee James Martin, SJ. The price includes light appetizers. This is a 21+ event; no undergraduate students will be permitted. 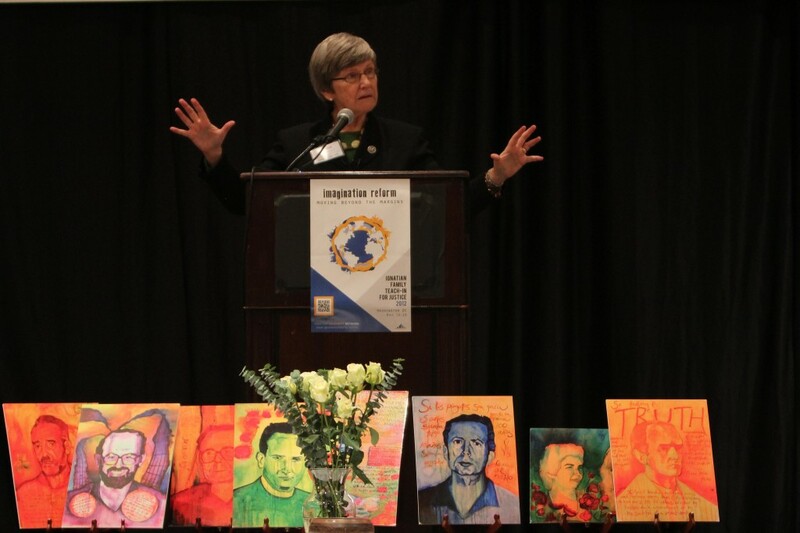 Joan Rosenhauer is the Executive Director of Jesuit Refugee Service/USA. In this role, Joan leads the organization’s efforts in the U.S. to fulfill its mission – to accompany, serve, and advocate for refugees and displaced people in over 50 countries around the world. Rosenhauer is a former JRS/USA Board Member and has spent most of her career advocating for social justice and mobilizing the U.S. Catholic community to do the same. As an Executive Vice President of Catholic Relief Services (CRS), Joan led the organization’s outreach, marketing, and communications – helping those in the United States respond to critical needs around the world. Prior to joining CRS, Joan spent 16 years with the U.S. Conference of Catholic Bishops, where she most recently served as associate director of the Department of Justice, Peace, and Human Development. Prior to that role, she held a variety of positions, including special projects coordinator and outreach coordinator for the USCCB’s Department of Social Development and World Peace. There are plenty of spaces at the Ignatian Family Teach-In for Justice for young alumni to dig into current justice issues, connect with former classmates and new friends, and reflect and act for justice. Join the growing number of individuals who use the Teach-In as a time to reconnect to the Ignatian network and the call to work for justice. 4:15 PM – 5:45 PM Q&A with Sr. Simone Campbell, S.S.S.. and Guest Emcee James Martin, S.J. Hear from keynote Bishop George Murry, S.J. and take part in a reflective prayer service to remember the Jesuit Martyrs of El Salvador. Nichole Flores, Ph.D. and the Peace Poets will offer perspectives on immigration and organizing for justice from the IFTJ mainstage. Two breakout sessions will address over 40 social justice issues and how one can connect with organizations working for social change. It is often described as one of the most inspiring celebrations of the Eucharist each year. Singers and musicians from across the country will come together to comprise the choir; those interested in joining this group can connect with the music leaders earlier in the weekend. Attendees are welcome to bring family members including children to the liturgy. Join the Ignatian family in calling attention to the importance of legislative advocacy as the diverse group of IFTJ participants gather adjacent to the Capitol Hill. The group will hear from passionate speakers and collectively commit to work for social justice via advocacy during Ignatian Family Advocacy Month in February 2019.